We've added another to our growing Stefan Feld collection of games. 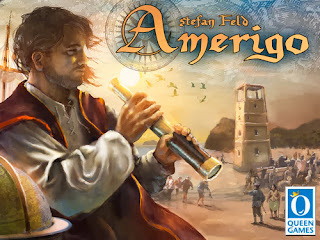 Just released from Queen Games and arriving today is the latest by Stefan Feld, Amerigo. Players take the role of an explorer like Amerigo Vespucci, journey to discover new lands, plan and build settlements, and collect resources. Similar to their board games Wallenstein and Shogun, Amerigo utilizes Queen Games' patented dice tower for player actions. Players drop action cubes into the tower. Each of the 7 cube colors relates to one of the 7 actions a player may take. The cubes that are dropped into the tower may not all make it out and/or may not be the only ones that come out. This creates an exciting element that requires the player to adapt to the tactical situation (the actions available to the players that particular turn) yet still rewards a good overall (long range) strategy, capturing the game's theme of exploration and discovery. Amerigo also has a modular game board set up system that provides a different game each time played. Also adding to our Uwe Rosenburg collection of board games is the newly released Caverna - The Cave Farmer in from Mayfair Games. 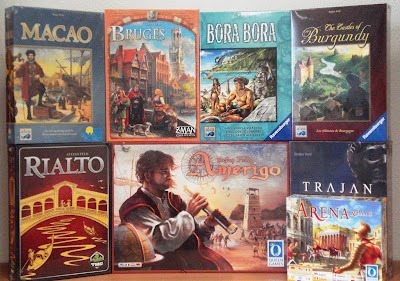 Uwe Rosenburg is the designer of popular games such as Agricola, Le Havre, Ora & Labora, At the Gates of Loyang, and Bohnanza. 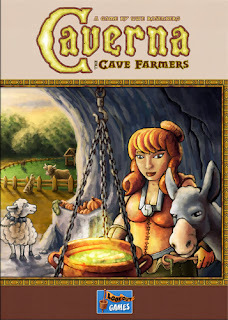 Caverna - The Cave Farmer is a heavy box chock full of components. We're talking hundreds of pieces. Players take the roles of adventurous dwarfs. Each player is the bearded leader of a small dwarf family that lives in a small cave in the mountains. You will need to dig for ore and rubies as well as cultivate the forest outside your cave in order to furnish caverns to become living spaces for your offspring and working areas for small enterprises. You will have to determine how much ore you want to mine. Ore is necessary to forge weapons that will allow you to go on expeditions to gain bonus items and actions. Digging deeper into the mountain may yield ore and ruby mines that add to your wealth accumulation. You can also add to your wealth with various agriculture options; cutting down trees to sow fields and fence in postures to hold your animals. At the end of the game, the dwarf player with the most efficiently developed home board wins the game.